My older guinea pig Pumpkin has been sneezing ever since I got her, but the vet said her lungs sounded clear so I thought it was just because of the bedding I was using. I changed them to fleece but it didn’t stop. I thought she might just have some kind of allergy as she never showed any other signs of illness. As of now she’s still eating and not losing weight. Yesterday I noticed one of her eyes looked inflamed. It’s smaller and pink around the edges, I am wondering if this is a sign she did have an URI but a slow progressing one. I had some antibiotic ointment and genteal that I applied to her eye, but it didn’t help, her eye looks worse now. She’s also tilting her head to the side of the affected eye. I made an appointment for the vet for later today. My question is would it be alright for her to start on baytril? She’s 4 months old. I tried uploading an image of her eye I am not sure if I did it correctly. I wouldn't put just any antibiotic ointment in her eye. Eye medications are especially designed not to harm the eye, and the fact that it's worse today may mean that the medication was the problem, or part of it. Genteal is specifically for dry eye, not for infection, and is not likely to help. Guinea pigs can go from mild URI to dead in less than 24 hours. I'd get her to a good exotic vet for another checkup. Well it is ophthalmologic antibiotic ointment so it was designed for the eyes. 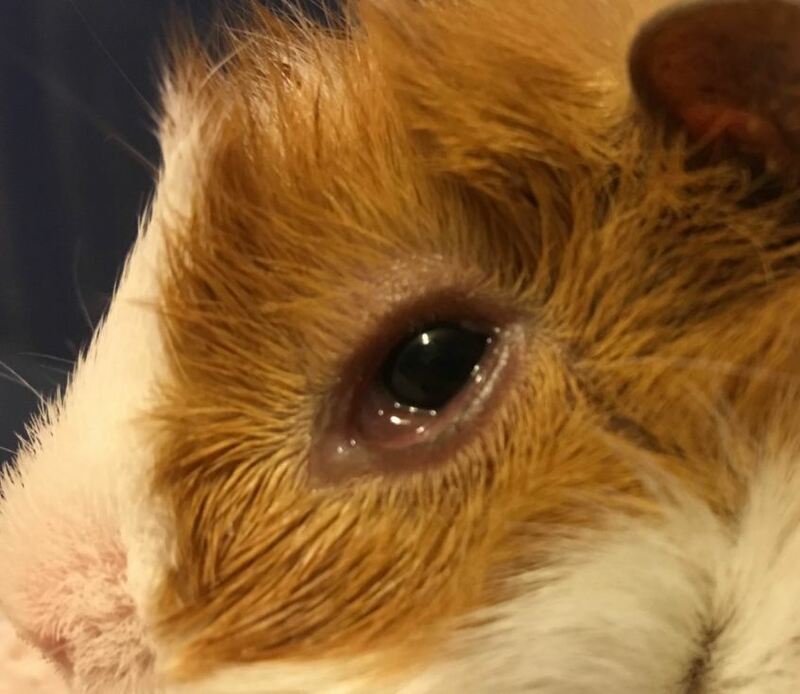 I got it from the vet to prevent eye infections when another one of my guinea pigs had an abscess behind her eye. I applied it because I didn’t want it to get worse but it did. It’s been progressively worse since Saturday actually. It started with her closing her eye. Then yesterday it started swelling up, before I applied the ointment, and today it swelled up more. Do you think she’s old enough to be put on baytril or should I opt for bactrim? My vet has just baytril on hand and if I go for bactrim I have to wait for the pharmacy to make it. Then it's probably an infection of some kind. She's a little young for Baytril, but they could try doxycycline. It's more apt to be effective than Bactrim. I actually thought bactrim was a good antibiotic, I’ll ask for doxycycline. Also just for future reference at how many months is it safe to start baytril? Do you know if URIs sometimes cause eye swelling? I did see some discharge in the morning but her eyes were not crusty. I’ll have to see if that changed once I get home. I am just trying to figure out if this is related to her chronic sneezing or perhaps it’s an ear infection due to the head tilting. Last edited by Cutepiggies on Mon Nov 13, 2017 6:04 pm, edited 1 time in total. The eye looks irritated. Perhaps a prolapsed gland? Oh thank you for posting that, I wasn’t sure if it worked or not. I still don’t know how to post photos here. I’ll ask the vet about that, the eyelids are inflamed too. Yes, thank you for the link, I was trying to use it earlier to get a better understanding of what she might have. Baytril is usually given when most of the bone growth is complete, around six to seven months. Bactrim IS good, for gram-negative organisms such as those that cause infections in the urinary tract. But most things that cause URIs are gram-positive, and Bactrim doesn't work nearly as well on those. Looking at that eye, I'd think it's the problem, not a URI. But it could be either, I suppose. Thank you, I thought it was around 6 months but I wasn’t sure. I see, that makes sense thanks for explaining it. I keep thinking she has an URI because of the continuous sneezing. We went to the vet and there is no damage to the cornea and she had nothing stuck in the eyelids so the vet did give me doxycycline. He mentioned in humans it sometimes treats eye problems without being applied directly to the eye. Hopefully it will treat whatever is causing her sneezing too. He wanted to give me an antibiotic eye ointment but the one he had on hand had an ingredient that was harmful to guinea pigs. I am going to have to give him a call and ask if I can use the one I have at home because that one doesn’t have the harmful ingredient. I would’ve asked at the visit but I couldn’t remember the ingredients offhand. Since I am now weighing her daily I noticed she’s not gaining weight anymore, she is stuck at 523-525g. Is this something I should be worried about? As long as she's not losing, I wouldn't worry much. She’s somewhere between 2 to 3 1/2 months old. She was around 1 month when I got her and I’ve had her for a month. I'd just weigh her daily to make sure she's not losing, and watch her closely. After they've been on an antibiotic, it sometimes takes a bit for them to start gaining again. Are you feeding her Critical Care? That's good for ailing piggies, and she might eat a glop of it off a spoon or her feeding plate. Just mix it according to directions and let it set a few minutes. It will thicken up and you can offer it to her. If she won't take it that way, mush up some of her favorite food and stir into it and try again. What is the harmful ingredient? Antibiotics that are dangerous when ingested can still be used in the eye, if that is what you are worried about. I am happy to report her eye is doing better. The inflammation is subsiding and it’s not as red anymore. However I gave her just one dose of the antibiotic so I don’t think that’s what’s healing her eye. I am inclined to believe it’s the antibiotic eye ointment that I used.Talking of the antibiotic it must taste awful because Pumpkin fights me so much when I try to give it to her. @bpatters, thank you so much for that idea, I made balls out of the critical care and she absolutely loved them. She ate a smaller one and a larger one yesterday. However , she was disinterested in them today, but I left them in their food bowl so I’ll see she ate them when I get home tonight. I also have these vitamin C tablets from oxbow that I’ll be feeding her. Her weight went up to 530g yesterday but this morning it’s back to 523g. So far her weight goes up one day and it’s back to 523g the next day. Perhaps it’s a trend, I’ll see in the coming days if it keeps doing that. @Lynx I wish I remembered the name, I believe the antibiotic was tetracycline but that’s not what the vet said wasn’t good for guinea pigs. There was another ingredient that started with a p, not penicillin, that he said was bad for them. Seven grams isn't a trend. It's less than the weight of one teaspoon of water, so can be accounted for by whether or not she's recently peed. Oh alright, I guess I am just hoping her weight will increase soon. Her eye is doing so much better it’s about 80% healed by now, however she’s not doing too good. She is now lethargic and stopped eating. When I weighed her this morning she was 496g that’s a loss of 27g. Could it be the antibiotic? She was eating before I started giving it to her. I am going to call the vet today and ask about it, but I don’t know what to do in the meantime. I still gave her the antibiotic today, but I don’t know if that was a good choice. I thought I shouldn’t just stop it before asking the vet about it. I also fed her some critical care with a syringe but she wouldn’t take more than 6cc. I am thinking I made a huge mistake by giving it to her, but I don’t know if it’s because of the antibiotic or if she does have an URI and it showed up. Perhaps I should have tried bactrim first and then switched to this antibiotic. My other guinea pig never had any adverse effects on bactrim. Yesterday when I came home she was acting fine, and wheeking for veggies. I gave her the antibiotic first thing when I woke up so I wouldn’t forget because I had to leave early again. She was also acting fine when I took her out today wheeking like she usually does. I only noticed she wasn’t doing well when I put her back in the cage. She just stood still when she usually popcorns and runs around. I didn’t get to watch her for too long as I had to leave. I am so worried because today I’ll be in school for the majority of the day again and I won’t be able to keep an eye on her. Is there anyone to hand feed her? Your description of her lethargy could be related to the antibiotic and/or illness and sounds very serious. I would call your vet asap. I talked with the vet and he said I should discontinue doxycycline and put her on bactrim. I also managed to finish my appointment earlier and went home to syringe feed her about 6 cc more of critical care. Sadly I am not going to be home for another 6 hours and there no one else home. I will try to see if I can leave class early to make it home earlier and give her some more critical care. I am guessing if it was an URI she would have shown other symptoms besides sneezing for one month. I feel so bad for giving her that extra dose of the antibiotic, I hope it will clear away from her system and she will return to her old self. Would giving her extra liquids speed up the process? I don't think you did anything wrong. She may be just very ill. Be sure to weigh her daily right now and do all you can to get enough food into her (see hand feeding link above). Extra liquids will help hydrate her.